I've come across these Indian print blocks many times at flea markets and I've actually had some sitting on a shelf for many years. 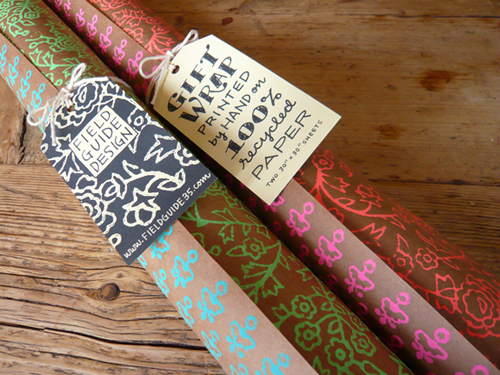 However, Darbie Nowatka of Field Guide 35 has taken it a step further by making her own screen printed wrapping paper. She has written about the process here on her blog. What began as a project for Darbie's own holiday wrapping paper has now turned into a business so we can take part in the action as well. Rolls of green and blue or pink and orange are available here at Sprout.